The popular saying goes, to see is to believe. We all want and need to have a vision, be it at the cinema, the TV, a photograph, or best, in real just looking around at the beautiful world and its beautiful inhabitants. Like, if the subatomic world is a reality, I must look at it through the microscope to satisfy myself that it is. It is through the telescope that we get a vision of what the galaxy and the solar system and beyond may be like. 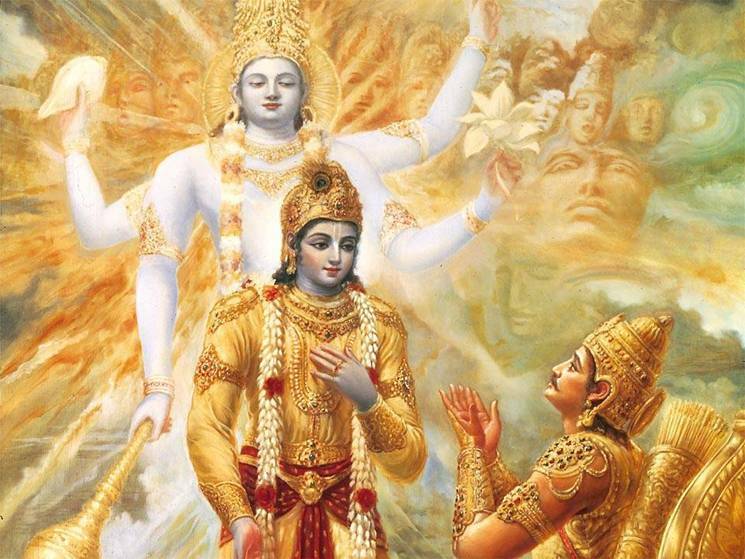 When all the discourses were done, knowledge imparted of the here and beyond, Gita’s hero Arjun turned to his dear friend Krishna and expressed a simple but fundamental wish. The abundant information, wisdom and insights remained somewhat academic to him. All the metaphysical, philosophical and poetic explanations failed to satisfy the urge to experience the truth by being afforded a grand vision of that reality – we cannot blame him for his childlike desire to see it. In such a circumstance we would too. 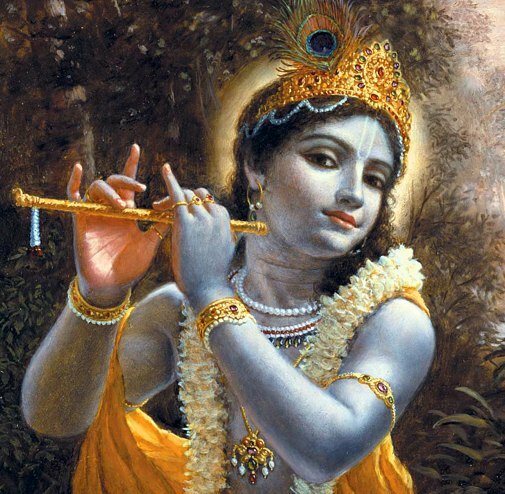 ”But you cannot see me with these eyes of yours” replies Krishna. Here I am reminded of ‘The Black Cloud’, a Science Fiction novel by astrophysicist Fred Hoyle about a mysterious cloud that arrives above the Earth. Scientists struggle to decipher its message and finally receive from it the technology to communicate with it. They set up the apparatus as instructed. It wishes to communicate knowledge about itself and the mysterious universe to any representative. A volunteer is seated before the instrument panel and he is connected to it. As the information comes in, the volunteer’s brain cannot handle the complexity and overload, resulting in his brain short circuiting into insanity. Likewise, limited by our mental capabilities, one can only absorb so much of reality and make sense of it. Scientists are familiar with the mysteries of Quantum Physics but can they truly comprehend it to make sense of it for us in our daily lives? Astronomers can conceptualize Black Holes and Supernovas but can they comprehend them in their totality? When a concept goes beyond our understanding we seek to symbolize it mathematically as a convenient way of simplifying the ultra-complex. A simple equation, E=MC square, makes us feel we have understood the inconceivable.We need giant telescopes to look at distant cosmic phenomena, electronic microscopes to look at the subatomic world, computers to engage in complicated math to understand Quantum facts. No wonder Krishna realizes the severe limitations not only of human vision but of the human mind as well. He alone ‘knows Himself by Himself’ as Arjun puts it. 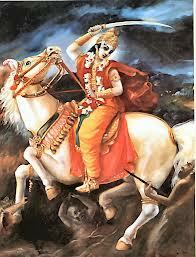 But Arjun is a dear disciple and friend and his request has to be honoured. Therefore through his generosity and magical Yogic powers (Yoga Kshemum), Krishna confers divine sight on him – celestial eyes (Divyam Chakshuhu). Even the one sun in our world is so brilliant that were we to stare at it we would be blinded, though we like to bask in its light and warmth. The radiance of a thousand suns shining at once is beyond conception – it would be death to look upon such brilliance. 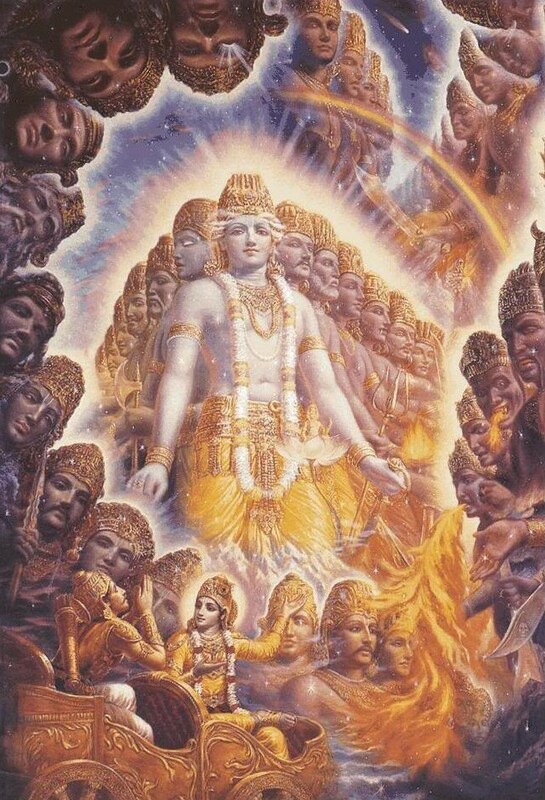 Therefore Arjun was fortunate to have the filter of divine sight to sustain the experience and enjoy such mind-blowing brilliance of the Super Conscious Essence. The form adopted to show Arjun the universal vision was necessarily anthropomorphic, with eyes, mouths, heads, hands and legs, the multiple colossi stretching all ways. Doubtless to safeguard against jolting him into insanity like the one suffered by our Science fiction volunteer with the mysterious cloud. But in fact a form was not relevant to the content which conveyed the substance of the message of divine reality. Arjun remarks that he sees an infinity of forms on all sides without a beginning a middle or an end. We cannot then think in terms of one form only. He sees the ‘sun and the moon in the eyes’, in other words the planetary systems and the physical universe. He sees beings flowing into him in the fires of dissolution and beings flowing out in the catharsis of creation. ”Who are you, I know not your purpose and desire to know you”. The vision has not sated his curiosity, rather he now dares to ask that cosmic colossi ‘without beginning or middle or end’ and planetary systems orbiting in what must be His eyes, who He is! Like a courageous soldier he demands to know Him. For that mighty eternal colossus the impertinence of the puny but brave soul must have been endearing. He doesn’t say much more. In the Gita, rather than the universal form speaking of His infinite greatness, it is Arjun who overawed, begins to describe Him. Wide eyed he calls out: ” You are the primal cause, abode of the universe, the imperishable, the being and the non-being, the primal god, the ancient one, the one who pervades the universe, the adorable, the greatest Guru and implores his forgiveness for his inadvertent transgressions and presumptuous behavior as a friend, asking the Lord to be compassionate ”as a father to a son, a friend to a friend and as a lover to his beloved”( not overawed enough to give up friendship and love). He admits that while he ”rejoices” at having seen what has never been seen before he is confounded with fear at what he is witnessing and can no longer bear to look upon such immense glory and fearful splendour and pleads that he would once again like to see his mortal friend. How very touching the melodramatic scene must have been. Thereupon the Great Lord, as it were, collapses in a moment the ‘Virat’ form with the brightness of a thousand suns resuming his mortal form of the Avatar, the gentle Krishna, touchingly consoling and comforting the terrified Arjun. The wonderful Arjun, quite like a Greek hero, courageous and righteous, rejoices on seeing his own familiar gentle friend Krishna once again. ‘In whatever way men seek me, in the same way do I carry out their desires, men pursue my path O Arjun, in many ways. The idea of Avatar was borrowed by the West from India, more particularly Hinduism, much like the concepts of Guru and Pandit were. James Cameron adapted it for his blockbuster film of the same name and PCs the world over for the abstract representation of users in the virtual world, but with modifications. The Hindu concept is actually neither of ones extension through a transporting machine into an alien world, nor of an imaginary portrayal of one’s persona on the web. The Sanskrit word simply means ‘descent’ and has come to mean divine manifestation through incarnation. But every soul’s reincarnation from the spiritual realms to the material world does not qualify. The incarnation of the Universal Essence (Brahma). as an anthropomorphic saviour on the physical plane, alone qualifies to be called an Avatar. In the Gita, Krishna the Avatar, assuming the deep sonorous voice of his true Self, the Universal Essence, explains when such a descent into the world becomes a painful necessity – the extraordinary embodiment of the Godhead, making it subject to all the trials and tribulations, pains and pleasures, fortunes and misfortunes of a mortal existence ( Christ on the cross), subject to all the earthly conditions, save one. The Avatar remains exempt from the Law of Karma and accumulates no effects, which would otherwise necessitate enforced rebirth under Karma’s inexorable and inflexible regime of cause and effect. Why the exemption, one may ask? Because the Law cannot touch or take into account actions that are dispassionate and made with no egotistical purpose. The Avatar’s actions are all altruistic and meant to ameliorate the sorry plight into which the material world has degenerated at the moment necessitating its incarnation. The Avatar is in fact the Hindu counterpart or approximation for prophet, messenger or ‘son of God’ concepts in other cultures. The difference being that the Avatar is not regarded as a representation of divinity but divinity incarnate itself, God in a human guise. The most popular of such Avatars are Rama of the Epic Ramayan and Krishna of the epic Mahabharat, whose discourses on the battlefield become the message of the Bhagawad Gita. 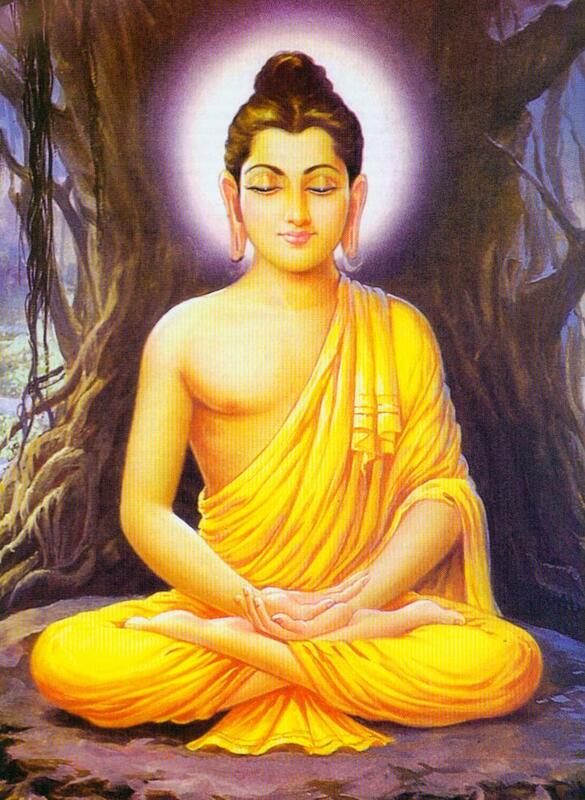 The Hindu pantheon also includes (apparently without permission) the Buddha, as its latest Avatar, without dwelling on his teachings or philosophy, which quite often is at variance with Hindu thought. Like other cultures, Hinduism also holds out the hope for the coming of yet another saviour. The present age is called the Age of Kali, Kaliyug, the age of vice. The Avatar to come as saviour in this age, Kalki is portrayed as a warrior on a horse with sword in hand ending evil with the apocalypse which accompanies him. Kalki , the avatar to come. Except for sages, philosophers, yogis and mystic-saints, most ordinary Hindus, while acknowledging a formless God (Nirgun) as the Universal Essence, generally engage in adulation and worship of the Avatars Rama and Krishna, while others worship the incarnated form of the Universal Energy (Shakti), depicted as a female deity riding a tiger or lion. The Avatar is etched deeply in the Hindu psyche and arouses a range of emotions from admiration, adulation, ecstasy and love, expressed through worship, prayer, meditation, song, poetry and dance. The Avatar then is an extraordinary phenomenon. On the one hand it has the charm and charisma of a leading film star, breathtaking to view and irresistible to the surging mob of fans. On the other, he has also the dignity, majesty, serenity and power of a king of kings into whose audience you are ushered, overwhelmed and awestruck. He has also the compassion and humility of a saint, melting your ego like a candle in tears and the love of a mother you meet after years of yearning separation. He is also Superman with supernatural abilities he is loath to use but of which one is aware. This film star who happens to be a king, a saint and Superman, all rolled into one finally is also your best friend who arouses unbearable emotions of love and intimacy. If you can succeed in conceptualizing all these amazing attributes together in one person for a moment, then you can picture an Avatar standing before you. In a few beautiful verses in the Gita, the Avatar Krishna tells Arjun his disciple and friend, who among poeple are dearest to Him. I read out the translation from the Sanskrit once to a friend from Australia, a ‘Lady’ of national standing whose husband was also a scholar, philosopher and mystic. She then asked me if she could quote the verses in her New Year’s greetings to her friends. I received her card with the following verses to my delight. 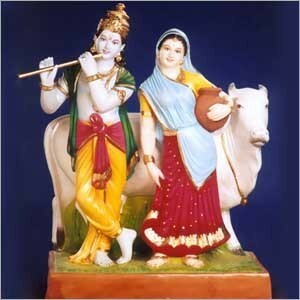 He My devotee, is dear to Me. He is dear to Me. He who is thus devoted to Me, is dear to Me. Full of devotion, he is dear to Me. Full of devotion, that man is dearest to Me. Surdas the Indian mystic-poet composed volumes of verse in praise of Krishna, the incarnated blue Avatar of the Universal Essence. One of his most popular songs seeks the Lord’s help and intervention in a moment of adversity. The poem seeks to recapture a popular Puranic (ancient) myth about the king of elephants, Gajendra, bathing, as elephants love to do, on the banks of the Indus river. But he is caught by a monstrous croc. and slowly dragged to the depths. The elephant calls out to Lord Krishna, whose devotee he is, to come and free him from imminent death by plucking a lotus and holding it aloft as a gesture of supplication and prayer. 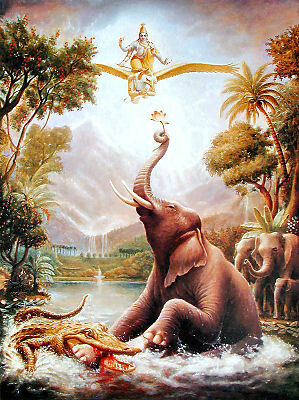 Krishna hearing the call hastens to his devotee on a golden eagle and saves him. The story is allegorical. The river is material existence, the elephant, the individual soul and the croc., temptation dragging it under. The soul cries out for help to be liberated from the tribulations of its material incarnation and rebirth and duly receives grace. 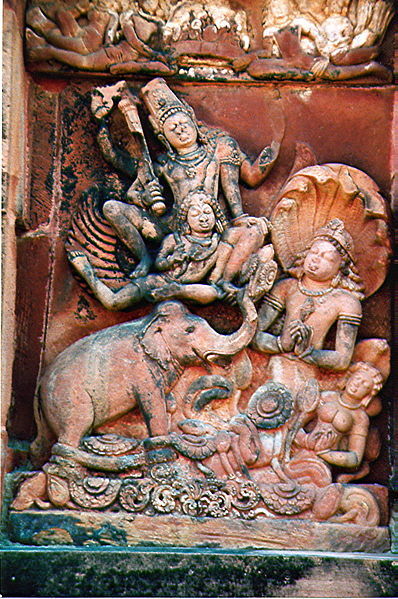 Surdas identifies with the elephant and seeks the Lord’s grace to overcome his failings. Have mercy I am drowning. 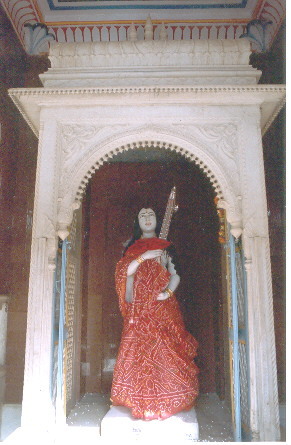 One of the most extraordinary personalities of the age of devotional worship in 16th century India was princess Meera Bai. 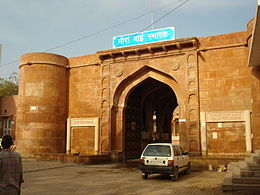 Born in the royal house of Merta in 1498 and married into the exalted principality of Udaipur to the heir apparent, she was destined to be a queen. 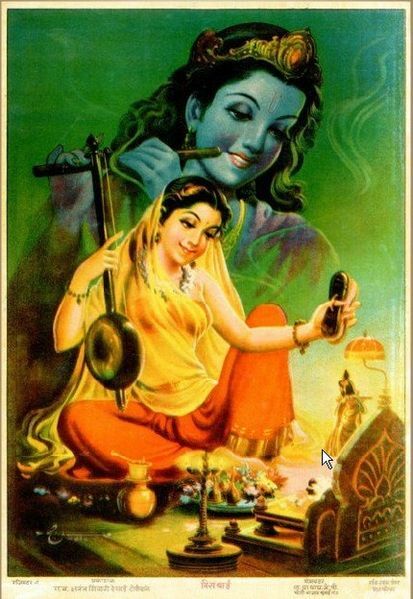 But she was the spirit of the age of devotion and had only one love, her god – the Supreme Essence incarnated as the blue Avatar, Krishna, the voice of the Gita. This obsession earned the displeasure of her in-laws. After her husband’s premature death, her growing association with seers and saints in public places, particularly the mystic cobbler Raidas, who became her mentor, aroused their unmitigated wrath. After several unsuccessful attempts to dissuade her and later to kill her with poisons and cobras, she eventually left the confines of the palace to become a wandering mendicant, singing songs of love for her beloved Lord from hamlet to hamlet across the land. 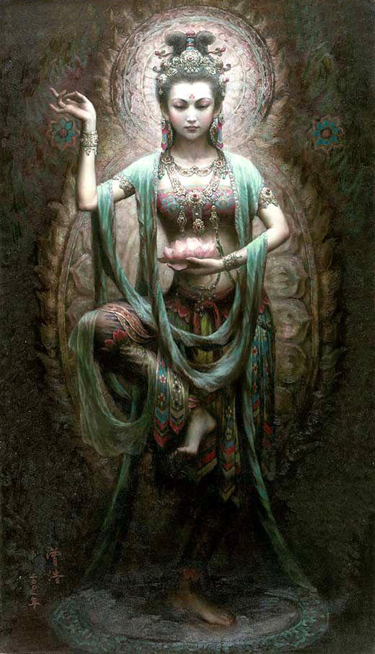 Finally she disappeared without trace at a temple, according to legend merging with the god she adored. Her poems are all love songs; looking over the ramparts of the castle for the caravan of her beloved; telling her mother that she dreamt that she had married her Lord; speaking of the cup of poison which she cheerfully drank, turning into nectar; hearing the footfalls of her Lord in the rain. Worship through love was now the new language of the mystical experience raging across the land. The ultimate path for communion between the physical self and the spirit within. While superficially giving the impression of being sensuous, Meera’s songs are allegorical. 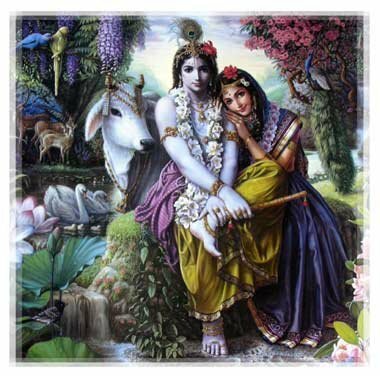 Pining for the lover was spiritual yearning to turn inwards to find the divinity within. Spiritual communion took place when the final gate of the ego stood ajar and the third eye of conscience opened, to show God standing resplendent before you as your innermost essence. Thus when she says, ‘come to my house’ she means, reveal yourself from within. And hymns of praise will I sing of you. All my failings will dissolve.